Koh Phangan is one of the most magical islands in Thailand. It’s notorious for its partying reputation, but there’s a serene side too: you just have to know where to go. 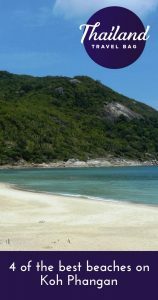 There are around 30 beaches on the island, with a narrow hilly road climbing through the jungle of the island, making most of them accessible by road. 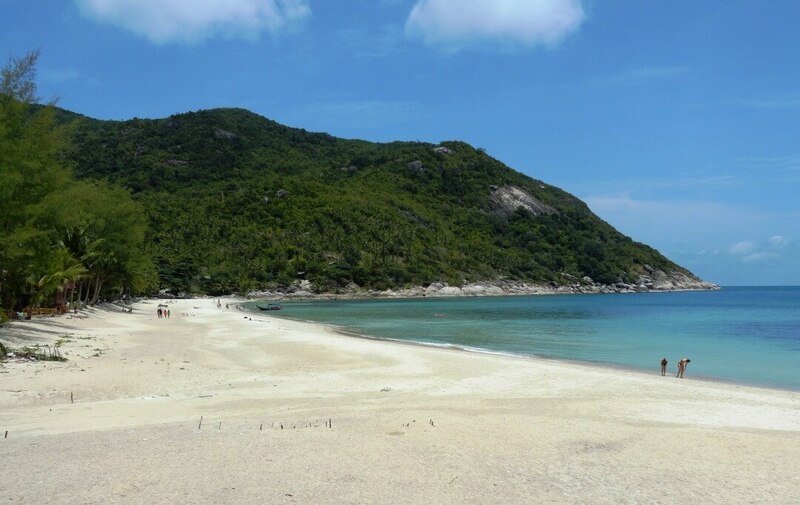 In this blog, we’ve selected 4 of the best beaches on Koh Phangan to visit and stay at. So we hope you enjoy these top picks. Bottle beach (featured image) is located on the north side of the island and is absolutely stunning. You get there by boat from Chaloklum beach or travel by road through the jungle. Once there, you won’t be disappointed. The white sand and the laid back atmosphere is serene. There are many resorts on this beach and they range from simple bungalows like Smile Bungalow to the high-end Chantaramas Resort and Spa. For something mid-range, we recommend Bottle beach 1. Bottle Beach is frequented by chilled out travellers and families looking for a peaceful getaway. Many visitors return to Haad Khuad year after year for the relaxed vibes. It isn’t the easiest of beaches to get to, but well worth the effort. And the snorkeling here is also fantastic, which is why we consider this one of the best beaches on Koh Phangan. Bottle beach 2, is a great place to eat on Haad Khuad. Best of all, in the evenings they often have a barbecue beach party with a campfire. Some of best beaches on Koh Phangan are actually close to the busy area of Haad Rin. Take a boat Haad Yuan to or Haad Tian and from there take a pleasant walk over to Haad Wai Nam. This is our 2nd pick for the best beaches on Koh Phangan. As you come over the hill, visitors are rewarded with a wonderful view of the beach. 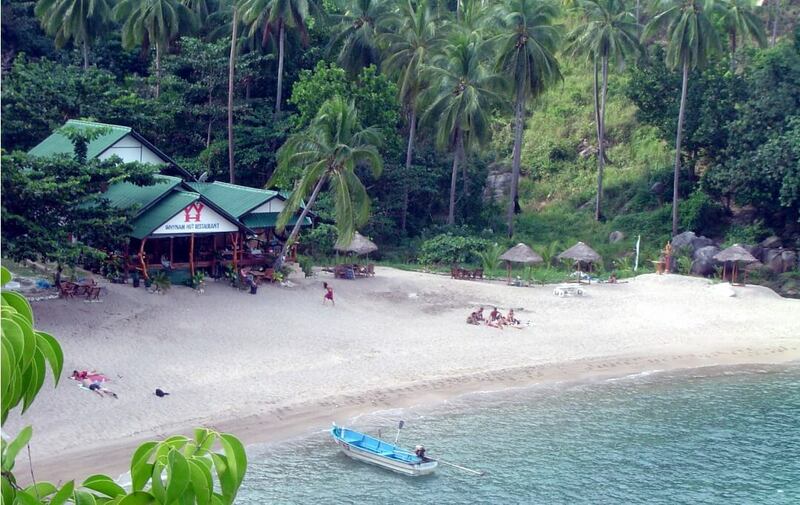 Wai Nam is Thai for ‘swimming’ and this is the perfect place to do just that. Nestled in its own little cove, it’s a serene spot where you will find just a few lovely bungalows that book up fast. Haad Wai Nam is arguably one of the most secluded and beautiful spots on the Koh Phangan. Not only is the beach stunning, but the surrounding jungle is amazing too. There are no shops, bars or restaurants on Haad Wai Nam, which adds to the peaceful nature of the location. For a great dining experience, eat at Bamboo restaurant which is located in between Haad Yuan and Haad Tian, high up in the rocks. From this viewpoint, there are spectacular views of the ocean. If you want to experience yoga in a wonderful beach location, head over to Haad Tian. Because this is the location of The Sanctuary. Not only is the yoga centre famous, but they also have an impressive vegetarian restaurant. Therefore this is a great place to feel healthy and relaxed. Make sure you take out plenty of cash prior to traveling to any of these beaches because they have no cash machines. Thong Nae Pan is a special part of the island. And it’s our 3rd pick for the best beaches on Koh Phangan. And best of all, you get 2 beaches! You could spend your entire holiday in this one area and be completely satisfied. It’s located on the North East side of the island and is accessible by a very hilly road. You can also take the Thong Nae Pan Express boat from Haad Tian, Than Sadet and Haad Rin. Yai means large in Thai and Noi means small, so that tells you something about the size of these 2 beaches. Thong Nae Pan Yai is quieter and more relaxed than Thon Nae Pan Noi. We prefer Thong Nae Pan Yai for its peaceful nature. 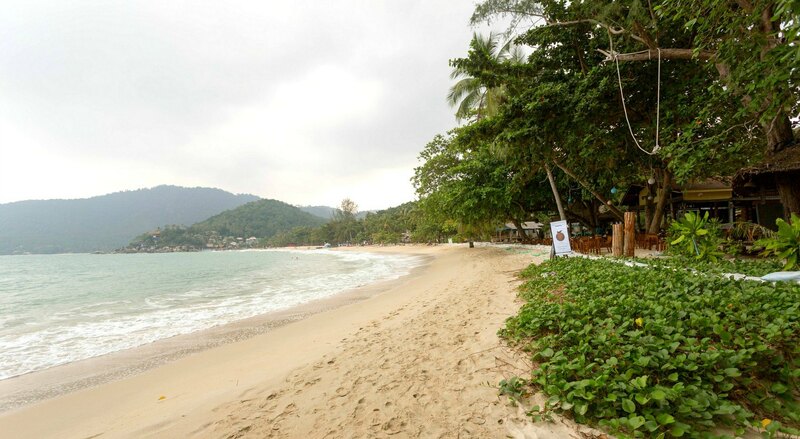 Longtail Beach Resort is on Thong Nae Pan Yai. The rooms here are nice but the main attraction is the wonderful beachside restaurant. They serve their food on beautiful little dishes shaped like longtail boats. Try the Gai Thod Phanaeng (deep fried chicken with Penang sauce). It never disappoints. Candle Hut is at the opposite end of the beach and has modern bungalows, a swimming pool and the comfiest beanbags to hang out in too. The restaurant at Candle Hut serves specialises in healthy food. Thong Nae Pan Noi is a totally beautiful beach and also great for snorkeling and swimming. It’s also host to some of the best hotels on Koh Phangan, like Anantara Rasananda Villas, which is a wonderful 5-star experience. our 4th and final pick for the best beaches on Koh Phangan is Koh Raham. This beach is located on the North West side of the island. Haad Son and Secret beach are also worth a visit, but nestled in between them is the very lovely, and very special beach called Koh Raham. Access to this remote beach is via Secret Beach. 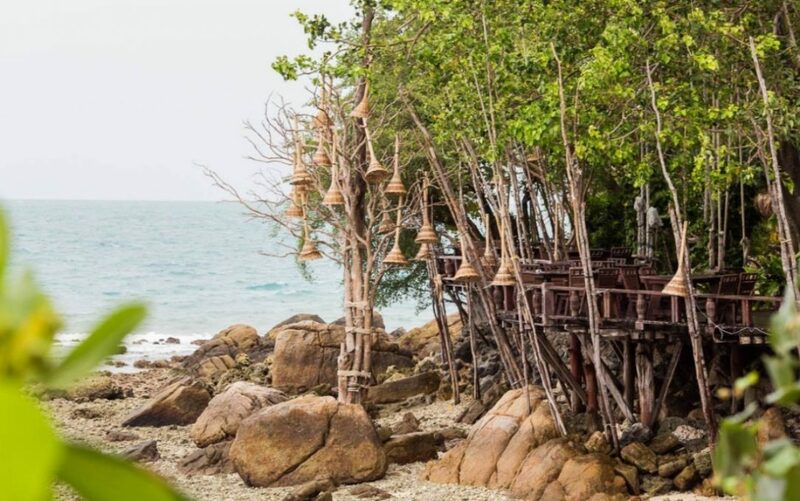 Simply walk to the end of the right side of Secret Beach and walk up the stairs and into Koh Raham Restaurant. This is arguably one of the coolest beach bars ever, by the way. There are hammocks to relax in when you are full of Phad Thai and Massaman curry. And best of all, there’s a tiny bridge that leads to a rock platform where you can jump off and swim with the fish. From there you can access the secluded Koh Raham. In addition to being a beautiful beach, Koh Raham is one of the best places on the Koh Phangan to catch the sunset. So that’s it on our blog about the 4 best beaches on Koh Phangan. Did you agree with us? What are your favourite beaches on Koh Phangan?